The Kardamos Hotel & Studios rests in a prime position on a hillside surrounded by trees and gardens with wonderful views over the sea and the lively holiday resort of Kardamema. Set on the outskirts of the village, this 2 Star family-run vacation retreat is just 10 minutes from all the shops, restaurants and bars in the centre, and just 15 minutes to the nearest beach. 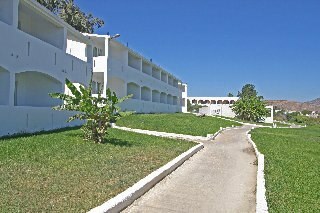 Guests to the Kardamos Hotel & Studios will enjoy the best of traditional Greek hospitality, refreshing dips in the large sparkling swimming pool, delicious snacks as well as peaceful sleep in one of 108 spacious rooms that offer guests a choice of self-catering studios or traditional hotel service. Kos Airport is 9 km from the hotel. Local Tips: Kardamena has many exciting and safe dives through a variety of dive sites including unusual rock formations with caves and tunnels, reef dives and the opportunity to dive through bubbles rising from a volcano. Food, drink and entertainment: Self-catering apartments as well as Rooms booked for Room Only accommodation. 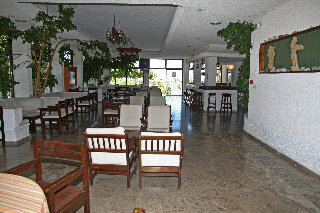 The Kardamos has a Snack Bar overlooking the pool and the village open from 9 am to 6 pm serving drinks and food. 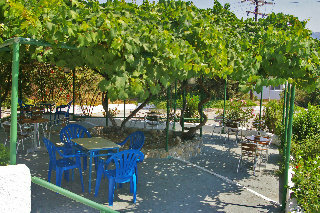 A large lobby area has pool tables, large screen TV and a Bar with an outside bar area under the shadow of splendid grape trees. Sports, games and activities: Luxurious outdoor pool, grassy terrace, free sun beds, Tennis and Badminton Courts, plenty of water sports at nearby beaches through independent operators. Additional: Reception services with friendly staff, safe boxes available at the reception. 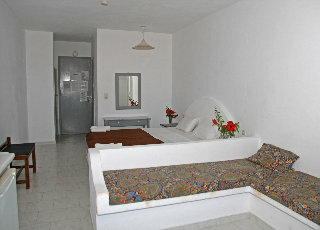 The Kardamos Hotel & Studios features 66 hotel rooms consisting of 62 double rooms and 4 units with 2 rooms and a connecting door. 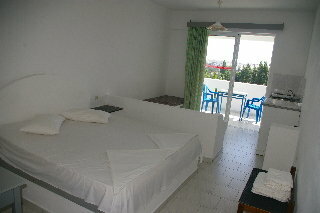 All rooms have a bathroom, air conditioning, fridge, and 70% of the rooms have a sea view. There are also 42 self-catering studios that can comfortably accommodate up to 3 people. Each unit is equipped with air conditioning, fridge, cooking facilities, and a large balcony with Sea view.